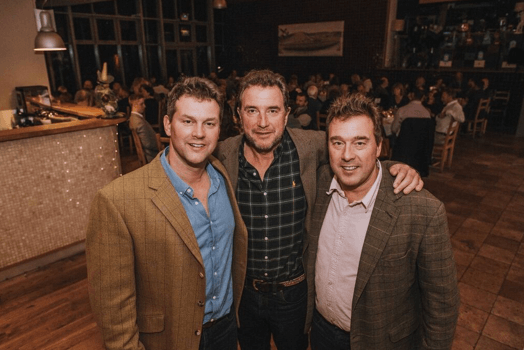 Devon foodies gathered in the Darts Farm restaurant for the annual Darts Farm Food Heroes dinner this month. 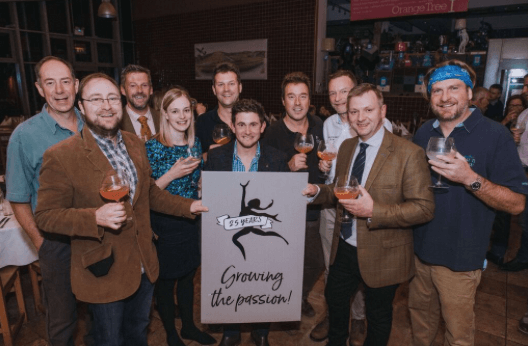 Hosted by the three Dart brothers, Michael, James and Paul, this sell out event honoured Devon’s local food and drink heroes and continued Darts Farms 25th year celebrations. After an exclusive tasting of Salcombe Gin’s limited edition sloe and damson ‘Guiding Star’ gin, guests enjoyed a delicious 4-course feast prepared by head chef Paul Mathews and his team. Each course was paired with a local wine or cider. Sharpham unveiled their young and vibrant New Release for 2018 during the starter of fresh Brixham lobster and crab from The Fish Shed or Ticklemore’s Devon goat’s cheese with Darts Farm beetroot terrine. Darts Farm home reared roast beef sirloin with seasonal vegetables from the farm followed, matched with Sharpham Pinot Noir 20187. Vegetarians were not forgotten with a stunning dish of Darts Farm roasted seasonal vegetables with pearl barley and wild mushrooms. The puddings were outstanding with a choice of caramelised apple tart with toffee sauce and clotted cream from award-award-winning Sutton Lucy Dairy or Willies Cocao rich chocolate mousse matched with Kingston Black Aperitif. The exceptional cheese board from Quicke’s, Sharpham, Cornish Blue and Hillside biscuits and chutney were accompanied by Sandford Orchards Ice Cider. Cider making has long been one of the prides of Darts Farm, and in recent years with Green Valley Cyder, establishing a reputation as a major player in the authentic cider world. On the retirement of Chris Coles, who ran Green Valley as a joint venture with Nick Pring, Barny Butterfield of Sandford Orchards was invited to take over the business, protecting the cider making tradition at Darts Farm and ensuring the future of such iconic ciders as Dragon Tears, Stillwood and St George’s Temptation, as well as the Green Valley Farm cyders. All will be made using the same techniques, recipes and indeed apple varieties as before. Celebrations and events continue in the run up to Christmas. Book a ticket for the Darts Farm Festive Indulgence Evening (5th December) a glittering gala (tickets £8.50) of tastings and demonstrations with special guest Michelin starred chef, Michael Caines MBE, with background music from a local school choir. 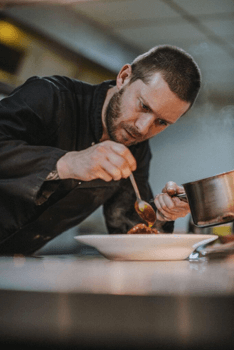 The Christmas Skills Night (19th December) has been designed to take your festive entertaining to the next level, with brilliant, practical workshops on everything from stuffing the turkey to adding razzle-dazzle to your Christmas table. Further information about Darts Farm visit www.dartsfarm.co.uk, call 01392 878205, follow on Twitter @dartsfarm or ‘like’ on Facebook.